70% of donations are now through a method called Peripheral Blood Stem Cell Donation that harvests the stem cells from the blood and not directly from the bone itself. PBSC soreness only occurs in some people when receiving the filgrastim. You may feel muscle aches for the 4-5 days then after the excess stem cells are collected, donors have reported feeling no symptoms 30 minutes to an hour after. Only 30% of the time marrow is extracted from the bone and this is most often to help sick children as they experience a higher success rate from marrow transplants as opposed to blood stem cells. For Marrow donation, local or general anesthesia will be used so there is no pain when the marrow is collected. There will be some soreness in the lower back area afterwards, and most donors can go about their daily activities a day after the donation. The soreness is similar to the feeling one gets after falling down on ice. Bone marrow COMPLETELY regenerates. Myth: Bone marrow is taken from the spine or they take out a chunk of your bone. Truth: Bone marrow is a fluid within the cavities of your bones and contains stem cells which are the source of all blood cells. If you are asked to donate marrow it is collected from your hip bone which is one of the bigger bones of your body and contains a lot of stem cells. 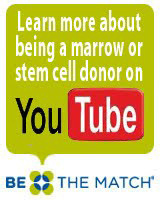 During marrow donation, less than 5% of the person’s marrow is taken. More importantly, more often, PBSC transplants are being done about 70% of the time instead of marrow transplants. Truth: The chances of a patient finding a match within their family is only 30%. 70% of the time, patients need to find unrelated donors for their transplant. Finding an unrelated match however, is often based on ethnicity. There is a very critical need to register ethnic minority donors onto the database because only 30-40% of all ethnic minority patients will find a match, whereas at least 80% of all Caucasian patients will find a match. The process of matching a donor and patient is actually a really hard thing and minority patients often only find ONE PERSON who is suitable to donate to them. If a patient does find a match, they often see it as a miracle. Myth: Somebody else who registers can be the donor. I don’t really need to register. Truth: Of the 6000 people currently searching for a marrow match in the United States alone only 30% will find a match in time. The rest will die. Most blood cancers are treatable diseases. There just aren't enough people in the registry to save the majority of them or at least give them a fighting chance. So many people say they never thought about it until someone they knew needed a transplant. It is important for people to realize that this is a community issue on an international scale, and that if someone you knew needed a transplant, you would want others to help them too. 20% of Causaians in need do not find a match in time. 70% or more of Ethnic Minorities and people of mixed ethnicities will not find a match in time. Truth: While there are some countries that still require a pin prick to collect a few drops of blood to join their registries, most donor programs, including those in the U.S., now use cotton mouth swabs that potential donors simply rub along their gum line for a few seconds to allow their tissue type to be entered in the Registry. Myth: I already donate blood so I don't need to join the marrow registry. Truth: Donating blood and marrow are two completely different and distinct progrms. Donating blood will NOT make you part of the marrow registry. Truth: Most people don't realize that if you aren't already in the registry it can take approximately 8-10 weeks or more to have your sample processed and added to the National Registry to be matched to the specific person you want to help. If the person you care about has a particularly aggressive disease at the point of diagnosis 8 weeks can be the difference between life and death. Myth: I can’t donate marrow because I can’t donate blood (I’m underweight / I’m anemic / I have diabetes, etc.). Truth: The requirements for donating blood are very different from donating bone marrow/blood stem cells. There is NO UNDERWEIGHT REQUIREMENT but there is a maximum weight requirement. People who are anemic (low iron) can still donate and even those with diabetics whose condition is NOT controlled by insulin can donate too. However, if they experience chronic back/hip/spine problems that requires medical attention, or if they have had a disc problem, they may not be eligible to register. Have them ask an AADP coordinator if they’re eligible.